« Bucs Trading Up To No. 1? 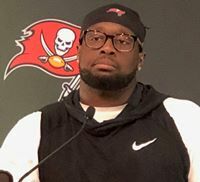 We have no idea what is going on with the Gerald McCoy drama. It doesn’t look good, however. Per Spotrac.com, the Bucs have the worst cap space situation in the NFL. In fact, per Spotrac’s calculations, the Bucs are some $9 million over the cap. And that’s before the Bucs sign their rookies, which in total should be somewhere in the $8 million ballpark. With GMC’s salary budgeted for $13 million this season, that’s a big fat red target for instant trimming to give the Bucs cap relief. As of yesterday, GMC (who prides himself as being a team leader), has yet to show up for voluntary offseason conditioning since the Bucs first unlocked One Buc Palace on April 1. That speaks volumes to Joe. Also, throw in the fact Bucs AC/DC-loving general manager Jason Licht has yet to commit to bringing GMC back for the 2018 season, and that all but signals GMC is a goner unless he reworks his contract to something team-friendly. But if GMC does return, Bucs coach Bucco Bruce Arians stated the team could sure use him. Back at the coaches breakfast at the NFL owners meetings last month, Arians stated if GMC is here, he plays. “[GMC] plays three-technique and we have a three-technique which penetrates,” Arians said. “He did it well four years ago. It sure smells to Joe as if GMC’s agent is playing a game of chicken with Licht, seeing who will blink first. Joe’s guess is Licht doesn’t blink. Blink?……no blinking here….it’s simple math….he’s gone…..just a matter of when they pull the plug…..
We need the draft quickly to have something new to discuss…..this is getting very tired. How about an update of real importance……such as the current number of ukuleles in Ali Marpet’s collection? I would think it would be borderline shocking if GMC comes back. My guess is he can not stomach the thought of a pay cut to play with the Bucs. Cuts and/or trades will be made to get under cap. Is Beckwith at voluntary work outs and is he working out. Are the Bucs being coy because most mocks have them taking a LB? GMC is garbage. Gmc does not fit this defense. Joe, 9 million over is With all 71 players currently signed. ~2M under cap for top paid 51 players on the roster. Gerald, vita, Ed Oliver. We aren’t good enough to let players that can play walk. And its the daily we are cutting McCoy article. Lets keep banging this drum. With the signings the Bucs have made – there is literally no choice now but to get rid of McCoy and his $13M salary either by trade or outright release. There is no “game of chicken” here. No “blinking”. Just cold hard financial reality to deal with. McCoy will not be a Buccaneer in 2019 and Gerald knew that at the conclusion of last season. Team leaders do not miss off season voluntary workouts. “Team leaders” who are big crybabys do Tom! His feelings are hurt….. he thinks he’s truly great. only chance this franchise and BA have is getting cancer93 off the roster any way they can. garbage player and fraud of a man! they already have committed to two to many career losers in lvd and dotston… lvd has not played consistently since schiano and well dotson is a failed feel good story that can’t play football… those fools are the board members of the losing culture along with their leader cancer93… all need to be ran before success can be tasted. It looks like we will have to cut more than GMC…….how about an article on who that may be? Wausa … I was thinking the same thing. For all practical purposes, GMC’s gone. 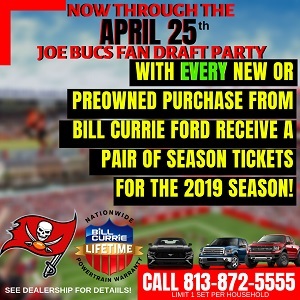 The shame of it all is that not only will the Bucs will get NOTHING in return, but we’ll also have to use a precious high draft pick to replace him. THAT’S disgusting. I suppose one could look at it like we’ll be getting $13 mil in salary Cap BACK by releasing GMC, but when you look at what you have to pay a Top-5 draft pick annually, the resultant savings (?) isn’t anywhere near $13 mil. DE Bradley Chubb (Broncos) was drafted #5 last year and his contract was for $27.2 mil over 4 years, almost $7 mil per year. Hope the Bucs grab Q Williams IF he’s there at #5, then draft the best MLB available in the 2nd round (would love to see Devin Bush fall to there, but wouldn’t mind Bama’s Mack Wilson or Clemson’s Tre Lamar in that scenario). But if Q is already taken by #5, draft MLB Devin White and pick up the best DT available in the 2nd round. Tbbf- Agreed! GMC is obvious, and the daily stories are becoming more tedious as the draft nears. I, for one, have ZERO idea as to how Will Gholston has escaped being cut so far. Forget the fact that he should’ve been gone last year. What in the eff is going on here?! There should be no suspense whatsoever! Time to change the mentality on the defensive side of the ball. This guy needs to go. Joe always brings up Kwon being the leader of the worst defenses in the NFL but gives this dude a pass. I’ll never understand that. I wanted him gone before the Ben apology, before the dancing on the sidelines, before him being mic’d up and telling Kwon he loves playing with him because winning or losing he knows Kwon just wants to have fun, before his advice to Jamesis was to just enjoy being a rookie. He’s not a tone setter and if he stays in the locker room he’ll be looked to as a leader and it’s time and best for him and the Bucs to go their separate ways. I think they keep him on until the draft for trade bait. He has been a solid player (not a game changer) but very solid when healthy. A few things need to line up for a DT to be great like Sapp was, thats we need to have an edge presence that demands attention and linebackers that can hit you in the mouth or run your arse down. Great player again but I do see him leaving due to us not being able to keep him at his current salary. The other option that management might be thinking is 13mil is ok to not get pounded up the middle and expose a week interior. I am not sure if we let him go there will be a half as good player to replace him. People are going to say through the draft but I always lean to conservative and draft picks in my opinion are always a overall risk even the best ones. There is no drama! Arians is just showing a little respect while showing GMC the door. Anyone can read between the lines and it’s written by BA himself! Do I wish he was more disruptive? HELL YES!!!!!!! Really that’s not even between the lines it’s straight up black and white. Same EXACT thing fans have been saying the last several years. Finally! Someone saying. PRECISELY what Bucnjim just said. “I know you’ve been the face here for awhile,but you’re my type of football player. At least not anymore you’re not”. Not my type.. That’s all happening. I think it’s time to move on , unless he agrees to reduce his salary. Bucs are gonna have to do more than just remove his 13 mil though so who else is possibly gone? Im surprised they haven’t released more players already. Even though we are loyal to our team\ players, with all the losing maybe its time to clean out a few high priced players who are not performing to their salaries. Every time I see a headline with GMC I click on the Comment link, do a CTRL + F, and search on “tmaxcon”. I think this is the first time I’ve seen you put Lavonte David in your cross-hairs. While I think many are too hard on GMC I have to say that many are not hard enough on LVD or Dotson. None of them are leaders. In fact, when I think of LVD I think of the kind of player that does his job well but doesn’t give a rip about how anyone else is performing. Why didn’t LVD step up to Chris Baker or any other underachiever over the past several seasons? ^^ I think you make some really good points about LVD, D-Rome. — I have had an issue with him ever since I saw that HORRIBLE interview after the Titans opening game debacle a few years ago (where LVD basically said that the D threw in their cards after the opening play of the game resulted in a penalty). I don’t think he shows very much football savvy or IQ, and for being a veteran, he doesn’t seem to make his teammates any better around him. I love how we have the worst cap situation… and yet have one of th worst records in football. So for one thing the entire defense needs to be more disruptive. And another. Do you really think the Bucs going 34 is going to keep offensive coordinators awake at night? One it is the Bucs trying to run it. On top of that it is not new. Not something nobody has gone up against before. So good luck with it. If we’re making a case for LVD, why not the whole entire defense? I can’t think of a single player outside of JPP that would be considered “invaluable”! It’s easy to see how one could be so enamored over average talent when what we have overall, is below-average talent. IMO, NOBODY on this football team is irreplaceable, especially on defense! 5-DASH-11 says so! Love when Joe cherry picks stats and numbers. The Bucs are actually under the cap by a little over $1.7M. This time of year, the only number that matters is the top 51 salaries. There, now you learned something today. FYI, when you eventually have 90 players on the roster, of course you’re going to be over the cap. All teams will. That’s why the NFL uses the top 51 this time of year. Devin White with the first pick. This defense still has many needs, by picking White you’re filling two of them. One he’s a great player at position of need, two he’s the type of leader this defense is sorely lacking. David is still serviceable, but he’s no leader, McCoy is as good as gone, and thank god, no leader, loveable loser. With the second pick, Risner, or a plug in play RT, Dotson has had it. Like Grimes, Dotson should’ve been replaced last year, he’s already hung on to long, and was never really more then serviceable his whole career. In the third round is when I find my DT to replace McSoftie, it’s a deep draft for DT’s so we should get a good one at the top of the third. After that, more of the same. To be honest here, Our Bucs are not even close Defensively to let a player like GMC go anywheres. GMC probably does not want to take a salary cut and..I don’t blame him. If he’s traded or let go, it will be any teams plus. Somebody out there will pay him. If GMC stays, I don’t think he will be as vocal after all this fan cashing. Personally, I would luv to see him stay. But if another team will pay him…then its to his benefit. Of course. Although if his “new” contract is for more than $8-$9M – I would be very surprised. I would put McCoy’s market value at around $7.5M per realistically – based on his age, wear & tear and what he put on tape last year. Not that his tape was “bad” in 2018 – but it was a bit – um – lackluster…. Gerald started complaining about his knees being a mess 2 off-seasons ago. His Pro Bowl days and highish end play on any consistent basis are likely behind him or at least fading fast. The Patriots would have traded him for a 3rd round pick LAST season. Arians doesn’t want this type of leadership on his team , it can’t and has not worked here !!! How many examples and live runs does it take , Arians doesn’t want that leadership for this team . Back when every news paper and web site said GMC s Staying in Tampa , I tried to make it very very clear that he wasn’t !!! Not a Chance !!! He is a Cancer ( t max has been spot on ) , Yes he’s a nice cancer but he’s still a cancer !!! He needs others to make him better , the role of him making others better isn’t what he is !!! Never has been ! I said it five years ago and I’m saying it again and there is no way Arians wants him in his locker room !!! He would fit in La or Philly but not here and yes he is worth a second to those teams as they only situationally need him for what he is situationally still top 3 in the league at !!! Pickgrin, he was the 28th ranked DT last year so pay him the 28th DT salary. $4M is what he’s worth to me. @tmaxcon … “d r, a low round pick could easily replace the crying clown that you are just freaking delusional over. you must be Hawaiians grandfather.” You are truly becoming myopic tmax (let’s go with the definition that says ‘lacking imagination or foresight’ OK?). Right now we have Vita Vea in the middle, with Beau Allen as his sidekick assuming that GMC is released. Do you REALLY expect this defense to improve with those 2 centering our DLine plus some ‘low round pick’ (like Stevie T perhaps?). We had major problems stopping the run last year with them & GMC, plus Kwon, Taylor & Bulloughs as our MLBs. Bucs NEED to solidify the middle of our defense or we’ll be toast; scheming doesn’t obviate the NEED for TALENT. And Mike, I do think that GMC’s a goner; the Bucs are just playing a stupid waiting game with themselves. His play has deteriorated somewhat & will probably slide even more this year if he stays. But more than anything, we NEED that $13 mil to pay the rooks AND hopefully fix at least one of our CB, RG & RB ‘issues’ by adding 1 or more veterans. they have set every WORST OF defensive record in NFL HISTORY with her anchoring the line so once again your argument holds ZERO water… anyone can produce the same garbage results that she has. Why is gholston still here !!! Waiting years for him to show something and not a damn thing but we pay him. Cap number mention doesn’t make sense. Everyone has stayed 2 million under and now we are 9million ???? Note to GMC: if you read this site, know that not all Bucs fans think you have always sucked, are selfish, soft and not a leader. Trust in yourself. You ARE getting older AND this is a new regime. You ARE still a member of the team. You CAN contribute to its success. Discretely renegotiate if at all possible and play as hard as you always have. Could mean less coin and less playing time, but if you think on it, those are not bad things if the team has success. This can be handled well or poorly…Well is what I am hoping for. Restructure and return… trust yourself….Go Bucs!